Dearest Blog: Yesterday it was off to Marquee Cinemas for the latest in Dan Brown's Robert Langdon series, Inferno. Spoiler level here will be mild, nothing you wouldn't know from the trailers. 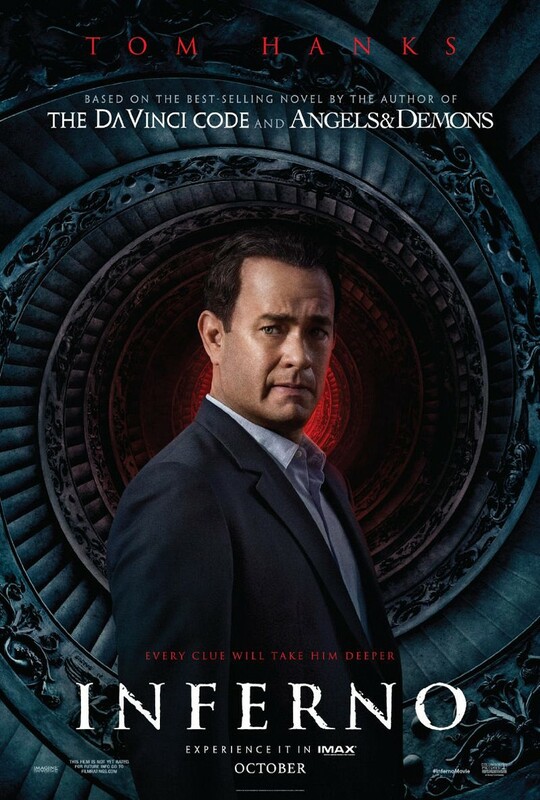 After waking in a hospital, suffering from amnesia, Professor Robert Langdon (Tom Hanks) teams with Doctor Sienna Brooks (Felicity Jones) to thwart a global threat. Okay, dear reader(s), here's the thing about this Langdon series: these movies just oughta be better than they are. All the pieces are there, yet the finished product is always decidedly mediocre...in fact, the middle installment was so forgettable I had to double-check to make sure I'd even seen it before moving on to the new one! Inferno, like its predecessors, is fortunate to have the eminently likable Tom Hanks reprising his role as Langdon. No matter what else a movie has going for or against it, Hanks generally guarantees it'll be at least watchable, and certainly that's the case here. Jones, on the other hand, is her usual blandly irritating self; if not for her weird teeth, you might mistake her for ten other actresses of similar age and appearance. Inferno boasts more of the series' usual lovely locations and tidbits of historical interest. There's action aplenty, with our heroes spending much of the picture running through crowded streets and imposing buildings, but ultimately the whole thing just feels too silly for something that pretends to be so intellectual. Inferno clocks in at 121 minutes and is rated PG13 for "sequences of action and violence, disturbing images, some language, thematic elements, and brief sensuality." Inferno is a passable afternoon's entertainment, but, sadly, it's nothing special. PS: Dear Cinemas Everywhere: I know Chris Pratt and Jennifer Lawrence are the cutest people on Earth, but that Passengers trailer is getting old REAL DAMN FAST.